High quality and high clarity Literature Bags for getting out your message! The perfect bag for hanging catalogs and brochures without exposing them to the elements. 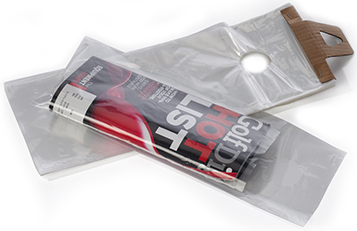 Hanging Literature Bags provide visibility and protection for samples, catalogs and promotional material. Our Plastic Literature Bags are mounted on a cardboard header with 1.75" hang hole for rapid loading. Great to use as door hangers bags) in hotels and for neighborhood marketing. Perfect for magazines, catalogs and many other types of literature. Looking for Custom Door Knob Hanging Literature Bags?